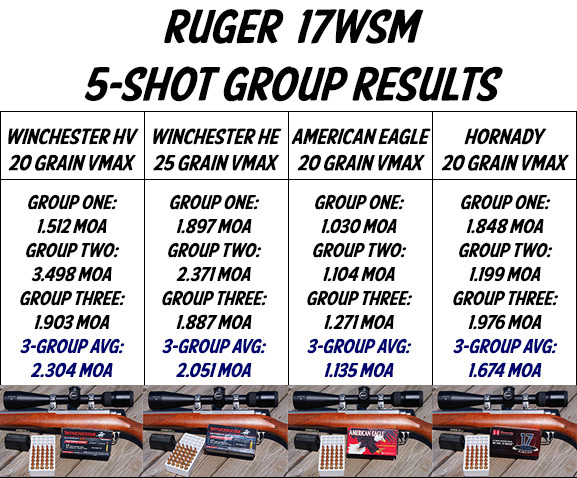 As part of its review, Varminter.com tested four different types of 17 WSM ammo for accuracy: American Eagle (20gr V-Max); Hornady (20gr V-Max), Winchester HV (20gr V-Max); Winchester HE (25gr V-Max). In the little Ruger, which suffered from a very heavy trigger, the most accurate ammo, by far, was the American Eagle, with an average 5-shot group size of 1.135 MOA at 100 yards. The Winchester HV was the worst, with a 2.304 MOA average for three, 5-shot groups. CLICK HERE for full accuracy test results. After accuracy testing, Varminter.com Review Editor Chambers took the Ruger 77/17 on a Groundhog hunt in Northern Ohio. Chambers was successful, bagging this ‘hog’ at 127 yards. The American Eagle 17 WSM ammo did quick work — the groundhog dropped without a twitch (watch video). I shot one recently at a manufacturers day on our local range. The gun is very nice, the trigger is AWFUL. The trigger must be at least eight pounds and has a creep as well as over travel. The Ruger representative said it was a legal thing, which I believe. Very sad state of affairs. Gun manufacturers have been pawning off crappy rifle triggers on “legality” and “lawyers” for years. Simple fact is they are crappy triggers, and the mfg would prefer to deflect the blame instead of correcting the problem. If mfgs can put rifles out that have 1.5lb triggers out of the box, or less, crappy triggers have nothing to do with legality (either that or the mfg needs a better legal team or insurer). Honestly, how many of these does Ruger really expect to sell @ $700+ with a joke of a trigger??? I still find myself wondering what the WSM will do that the HMR will not *at the ranges at which the former has sufficient accuracy*. The Ruger’s disgracefully poor trigger notwithstanding, I’ve yet to read a review of any rifle that compliments its accuracy, or compares it favourably to the HMR in that respect. The WSM may indeed have better ballistics, but if it won’t group at least as well as the HMR then that’s pretty much irrelevant. Bought one of the first ruger .17 WSM’s. Beautiful rifle. Gave it to my father-in-law to use for groundhog hunting, along with 5 boxes of American Eagle ammo. Topped it off with a Redfield 3×9. He has been hunting all his life, and at 84 years old, he says this rifle is pure joy to shoot. He was using a Ruger .17 HMR prior to the WSM for varmits. Sighted in .5 inch high at 100 yards. He had shot 68 groundhogs with it to date. Said it has more knock down that the HRM and more accurate, shooting and hitting groundhogs from 40 yards – 200 yards plus. Not a scientific review, just a real world experience review; it’s a winner with this family. I bought this rifle and the first thing I did was change out the 7.5 pound trigger for one adjusted to 1.5 lbs. Put a quality scope on it and started a proper break in with a lot of barrel cleaning between every five shots. I have now shot over two thousand gophers some out to 250 yards. Off the bench I consistently shoot under half inch groups at 100 yards. I’ve had 22 mags, 17HMR and nothing comes close to the performance of the Ruger 17WSM. No ricochet problem as the bullets blow up on contact, instant kills with no gopher crawling down a hole wounded.